Emi served the WBrC judges a varietal called Laurina, a mutation of Bourbon, which she sourced from Daterra farm in the Cerrado region of Brazil. “Due to the low amount of caffeine and chlorogenic acids, Laurina is hard to extract bitter,” Emi says. The coffee was processed via semi-carbonic maceration, which Emi says gave the Laurina a winey, tartaric acidity. 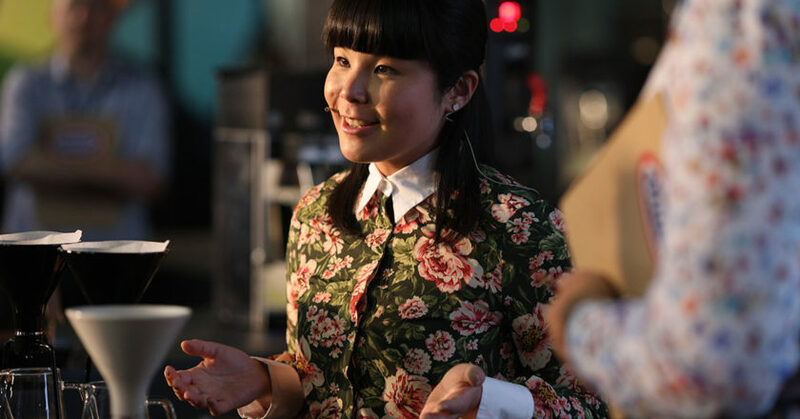 To celebrate these flavour characteristics in the cup, Emi used a Gina coffee brewing device to combine full immersion and drip processes when brewing her coffee. Emi’s brewing recipe used 17 grams of coffee, and 220 grams of brewing water in total. She began with a full immersion using 50 grams of water at 80°C for 45 seconds. Emi says this gently extracted the sweetness and fruitiness of the coffee. Emi then switched to drip, using 100 grams of water at 95°C for one minute. She says this opened up the coffee, extracting diverse layers of flavours. Emi returned to full immersion, using 70 grams of water at 80°C for another 45 seconds. This gave the coffee its juicy body. She finished her brew with another drip, lasting 25 seconds, then stopped the extraction to ensure a clean finish. Emi says she developed this recipe through constant reconfirmation and cross-checking of results. Emi hopes to use her new credentials as the 2018 World Brewers Cup Champion to open a roastery and barista training centre with her business and life partner Mathieu Theis, who placed third in the 2018 World Barista Championship. “Mathieu and I wish to run a place where baristas and brewers can learn from each other and train for championships,” Emi says.